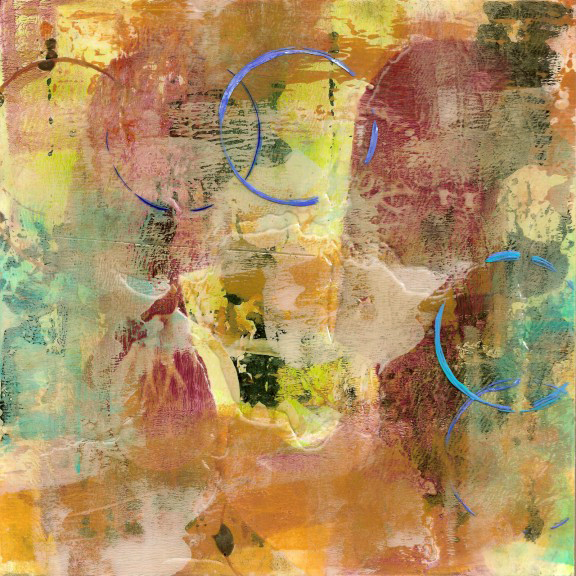 I think these colors suggest the transition from summer to fall, which is why I chose this painting. By the way, I have no idea who owns it now. Happy Fall to my friends in the Northern Hemisphere! It’s a nice, quiet Sunday morning — the second Sunday of autumn. I love fall, as you may already know. It’s all too brief, and maybe that’s what is so enchanting and bittersweet about it. There are only a few signs as yet . . . the days are shortening, there’s a nice little chill in the morning air, the hummingbirds are making a few last passes at the feeders before their grueling trip south, the grass is beginning to slow down, and a few leaves are starting to turn ever so slightly. My old girl Reno will turn 16 the end of this year, and I wonder how the cold is going to affect her this time. She’s already getting a little stiff-jointed, but she still amazes me for a geriatric doggie. 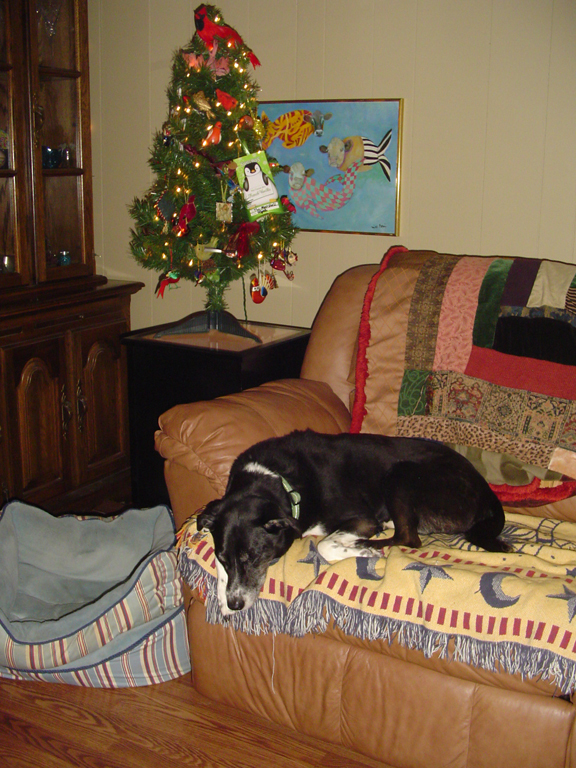 Here she is in a picture from last Christmas. I fully expect her to make it through at least one more. She has reached a healthy ripe old age for a dog of her size. I’m happy for every day that I have with her. 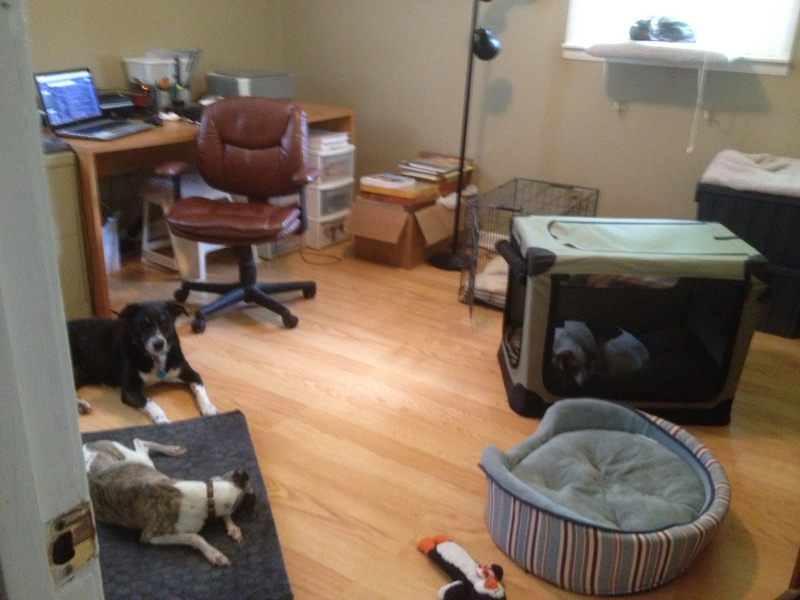 Here they all are in my office with me. This is the morning nap scene just about every day. You can barely see Blueberry the kitty in the window here. I have extra crates and beds so they can pick their favorite each time. That’s Abby the whippet in the foreground, and in the soft-sided crate is Angie, the little beagle mix that we adopted from the shelter last November. My fall garden is planted, and if all goes according to plan I’ll have both sweet potatoes (which are still growing in the ground from the summer) and some broccoli for Thanksgiving dinner. I hope you’ve enjoyed your Sunday so far and are thinking creative thoughts. I have just returned from my trip to north-central British Columbia with a beautiful bunch of river-bottom potatoes and farm raised beef plus bright jars of raspberry jam. There is no winter garden planted there or here. We do not get enough sun and my parents will have many feet of snow. However, I love the idea of a winter garden and the harvest time. Your painting seems to fit this mood Martha. All the best of today to you! So nice to see you, Terrill. Your bounty sounds wonderful. As you may know, this garden is a very big science project for me, as it is my first real one. Beginner’s luck sustained me for the first 2 years, but now the word has gotten out through the bug network that I’m here and have plenty for them to munch on. It’s been a challenge these past 2 seasons. That’s one reason I love a fall garden. All you really have to do is pick off the army worms and cabbage worms every day or two. love that painting, colors and patterns! Reblogged this on The Dreamer. Thank you for sharing your cozy, warm life with us. Your creative efforts as well as your pets, each one a treasure, has the feel of a real home to me. Autumn is a sentimental time of year, bringing out the best of what we have to offer, or so I feel anyway. Your sharing has proven this in numerous ways. Another striking piece if I do say so myself. Your work is amazing. Never stop being who you were truly meant to be. One with a caring, creative heart.